This exhibition spanned the period of Western exploration from the later eighteenth century up until the establishment of the Transcontinental Railroad in 1869. During this time, vast, uncharted areas of the West were gradually explored, mapped and remapped, while utopian fantasies of “lost” cities of gold, a Northwest Passage to India, and an American Arcadia on the Pacific Slope were reconciled with geographic reality. This 100-year period of exploration and westward expansion is traced through an evolution of foreign and American maps and mapmaking techniques. In a multitude of ways, many of the maps featured in the exhibition played an influential role in determining the economic, social and political future of the American West. Territorial Ambitions contained approximately fifty maps from The Society’s collection that were exhibited for the first time. 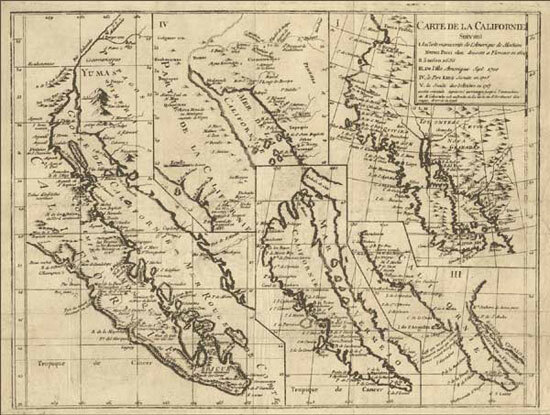 Works on display included Didier Robert De Vaugondy’s 1772 Carte de Californie, La Pérouse’s journal of 1785-88, John Frémont and Charles Preuss’ 1842 Map of Oregon and Upper California, A Map of Discoveries Made by the Russians on the North West Coast of America, 1771, and G.K. Warren’s 1854 Map of the Territory of the U.S. from the Mississippi to the Pacific Ocean. The exhibition also featured gold region maps, coastal surveys, railroad maps, bird’s eye views, early maps of San Francisco, antique surveyor’s equipment, and a 15-minute orientation video.